Marbella Lakes is proud to show off its community and hosts regular community wide open houses of properties for sale.The Community Open House is generally held the second Sunday of every month. Come see our beautiful community! The schedule of open houses is shown below. Please note that the Open House sign shown in the picture to the left is the only board approved sign allowed for your open house. 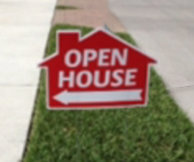 Only one open house sign per property and NO directional signs or company signs are allowed Any others will be removed and can be picked up at the guard house. Open houses are only allowed in Marbella Lakes on the dates & times displayed below. All Realtors Please Note: No information or marketing materials are to be left at the gate house, clubhouse or any other Association owned property.